The spatiotemporal patterns formed in a two-electrode cell are investigated with oscillatory nickel electrodissolution in a microfluidic flow channel. Because the distances of the two working electrodes to the reference/counter electrodes at the end of the flow channel are different, there is an underlying dynamical heterogeneity that occurs in the form of different solution resistance. When the electrodes are placed far apart, due to the large heterogeneity, localized current oscillation on upstream or downstream electrode is observed. It is found that the other confounding factor in the generated patterns is the electrical coupling strength, that can be tuned by the distance between the electrodes. As the distance is increased (and the coupling strength is decreased), a transition from (nearly) in-phase synchronized oscillations through no synchrony to anti-phase current oscillations occurs. The localization of oscillatory behavior is explained with a two-parameter stability analysis by a bifurcation diagram of a single electrode. An ordinary differential equation model is derived to predict oscillatory patterns at different placement and all experimental findings can be reproduced. 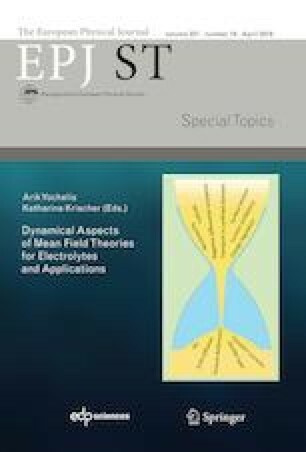 The results thus demonstrate the use of coupled ordinary differential equations modeling approach to the description of self-organized temporal and spatial features of the micro-scale electrochemical system.